If you fly or musky fish, there is a pretty good chance that your rods are very long to meet your needs. If you value protecting your rods, we now have a new product to keep them covered. The MEGA Big Stick Rod Gloves are for rods that are over 8' in length and are available in both Spinning or Casting Rod Gloves. 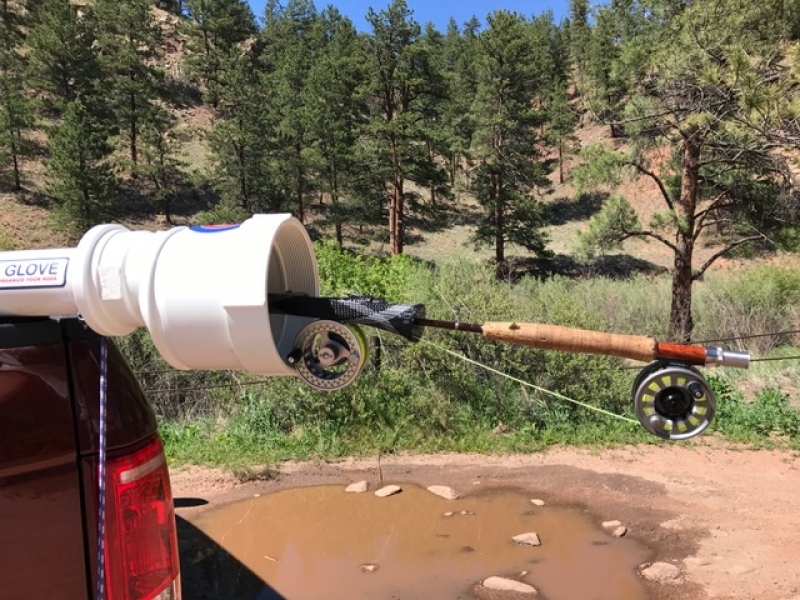 The newest addition to the Rod Glove family, The Mega Rod Glove now offers protection for longer rods and we recently received feedback from one of our customers who shared her experience with the NEW Mega Big Stick Rod Gloves. Linda indicated "I fly fish, often with two 9 ft rods, one for dry flies and one rigged for nymphs. And, I like setting up my rigging prior to a day of fishing. I was looking for a good way to transport rods while driving from fishing spot to spot without breaking them down. Putting rods in the truck bed allows them to bounce around with the ruts in the road and when I put a rod inside projecting out the rear window the line and flies often became tangled. The ideal was a rod vault mounted on the roof, but $300-400 was way beyond my budget. So, after finding some DIY ideas online I made a two rod holder from PVC pipe that fit across the truck bed. The three inch tube was lined with foam pipe insulation and while two rods fit nicely, there was concern of the guides and lines tangling. Hence the search for a rod sock/glove to keep the rods separate. Plenty of products were found on Amazon and at Bass Pro Shops, but none long enough for a 9 ft fly rod until I found the Rod Glove, Mega Big Stick.The Big Stick fits over one rod and assures there is no tangling with the line or guides of the other rod when using my PVC rod tube". Recently, I went fishing without the PVC tube. I rigged my rod before hand, slipped the Rod Glove over it and put it inside the truck cab with the end a few inches out the rear window. No tangling or flies caught in the seats. Easy on, easy off and safe, protected transport from site to site. If you want protection for your longer rods, check out this NEW product.